Belfast’s Tommy McCarthy will be looking to take a step towards the British title when he takes to the ring on the MHD Promotions in association with A McLean’s Bookmakers show at the Ulster Hall on February 9. McCarthy - ranked three in the British ratings will start his 2019 campaign against Jiri Svacina of the Czech Republic. And McCarthy says he can’t wait to get started at the world famous venue. “I have never fought there as an amateur or a professional so I am looking forward to it. “It was very frustrating to be out of action for 12 months before my fight at the Shorts club at the end of last year. “And that is why I have linked up with promoter Mark Dunlop. He is getting me the fights and they are coming thick and fast and that is what I wanted. “Mark is getting me the opportunities and I am ready to deliver. 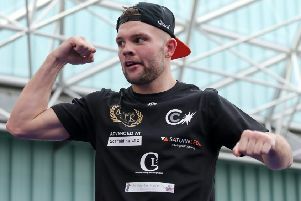 The fight at the Ulster Hall will be tough but I am ready for the challenge,” said McCarthy. And the Belfast fighter believes that he can get back in the title mix after a couple more fights. “Mark is talking about me going for title after a few fights and that is what I want. “I have put my trust in Mark and I have seen the good job he has done with James Tennyson and Paul Hyland jnr. “I believe I am at the same level as the two of those guys, so I want to get me hands on a few titles. “But I am fully focused on the fight at the Ulster Hall on February 9 and once I take care of business there I will move on,” added McCarthy. The Ulster Hall show is headlined by James Tennyson who steps up to lightweight division to take on Portsmouth’s Garry Neale (10-0) in his first contest since losing his recent IBF Featherweight World title challenge in Boston to Tevin Farmer in October. Paul Hyland Jnr takes on Miroslav Serban - the current champion of the Czech Republic - in another good contest. Hyland jnr will be looking to get a few wins under his belt before having another crack at the British title after losing last year in his bid to take the Lightweight title off Lewis Ritson in Newcastle. Also on the night County Tyrone’s Feargal McCrory takes on Karl Kelly of Dublin for the vacant Irish Lightweight Title. The show also features Cathy McAleer, Luke Wilton and Mathew Fitzsimons. Promoter Mark Dunlop said: “While watching the Ulster Elite boxing finals last Saturday night at the Ulster Hall I have to say the atmosphere was incredible. Meanwhile Sean McComb and Steven Donnelly have been confirmed on the undercard of Conrad Cummings versus Luke Keeler II at Belfast’s Ulster Hall on March 29. ‘The Donn’ (4-0), who fights out of Ballymena, also made a swift US debut when he outclassed Ray Cervera at Madison Square Garden.